Have you tried to move pictures from iPod to iPhone with iCloud but found it is not a convenient way? In this article, you will learn a direct way to move all your photos from iPod to iPhone, just read it. 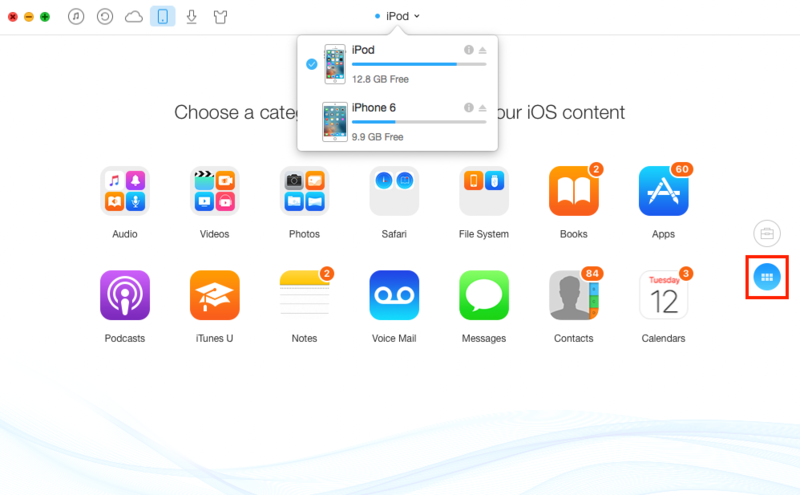 Just download AnyTrans and have a free trial after reading this guide how to move pictures from iPod to your iPhone without iCloud. Apple says, if you are one of Apple users, you can set up your Apple ID and enjoy iCloud，such as sharing pictures via Family Sharing or My Photo Steam, storing PDFs or other documents in the iCloud Drive, and backing up your important contents. 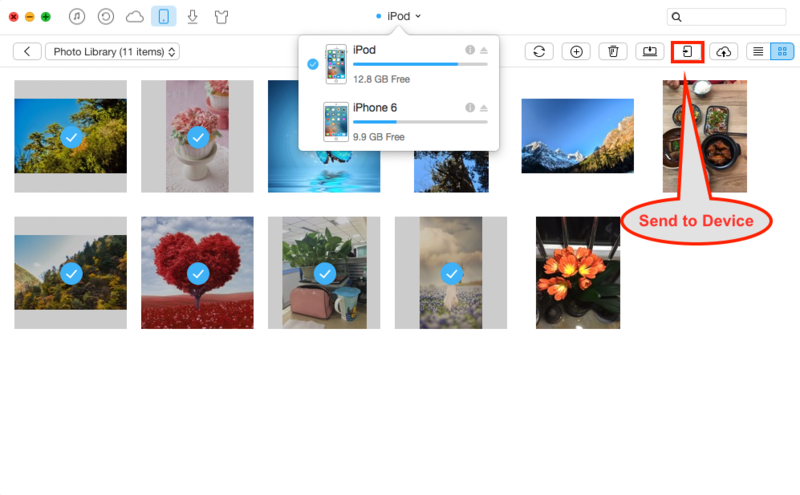 Therefore, when you need to move photos from iPod to your new bought iPhone, naturally iCloud is the first choice emerging in your mind. However, if you want to use iCloud to sync pictures from iPod to iPhone, you should make sure that the iPhone and the iPod have the same Apple ID. Only in that way, you can transfer pictures from iPod to iPhone freely. In addition, the process of transferring requires WI-FI support, and you only can enjoy 5GB free storage space (You have to pay for it if you want more iCloud storage). So is there some direct and safe way to move photos from iPod to iPhone? Absolutely, YES! AnyTrans can help you with this problem. With this tool, you can directly sync pictures or selectively move photos from iPod to iPhone. Before learning the steps to transfer photos, you can know something about this tool firstly. 1. Safe: Won't lose photos from iPod or iPhone while transferring. 2. Selective: Preview your pictures and choose your wanted content to transfer. 3. Direct: Directly move your photos from iPod to iPhone in a few clicks. Now, free download it and begin the steps to transfer pictures from iPod to iPhone. Step 1. Download and launch AnyTrans > Connect iPod and iPhone to computer > Select your iPod and then click to go to files manage page. Step 2. Click Photos > Choose one album (take Photo Library for example). Step 3. Select pictures or all of them, and click "Send to Device" to move them to your iPhone. 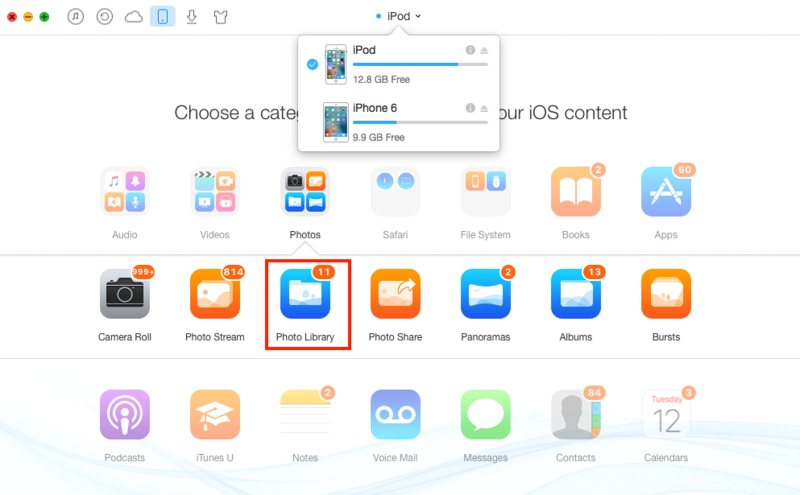 Following the steps above, you can move photos from iPod to iPhone easily and directly. And AnyTrans also can support music, videos, and other important contents transferring from iPod to iPhone. Why not have a try? If this article is helpful, please share it with your family or friends. And if you meet any problem when moving pictures from iPod to iPhone with AnyTrans, welcome to comment or contact our support.